A Jewish girl, my roots firmly from the East End of London, I chose to train at one of London’s finest teaching hospitals, The London Hospital in Whitechapel. No not as a doctor as you might expect from a Jewish girl, but as a nurse! Yes, that’s all I ever wanted to be, but when I applied to the hospital, along with many other teaching, and non- teaching hospitals in London, neither my East End roots, nor the connection with The London Hospital through a late, great uncle, about which I was not even yet aware, had anything at all to do with what drew me towards doing my training there. I applied to many hospitals, as was the custom back in the late 1970s and awaited the replies. I received several - some were knock-backs, others asked me to interviews which I attended. Then I was invited to attend an interview at The London Hospital. As I arrived at Whitechapel Station, an area I had until then, only heard about from my elderly relatives, I felt a real warm sense of ‘home’ even before leaving the station, for, as I departed the train and looked around for the exit, I saw a sign that said ‘Way out and to The London Hospital’. I liked that. It gave me a tingle that I hadn’t felt from any other hospital (or station) I’d visited until then. I exited the station and there were lots of barrows selling fruits, vegetables, clothes and all sorts of other items, just like on EastEnders; the main Whitechapel Road just buzzed with local people shopping and talking. Then I looked up, and over the road was a magnificent building that spelt history, love, care and hope, and although I hadn’t even crossed the road yet, I had a feeling that this was where I wanted to spend my nurse’s training. Isn’t instinct a funny thing? Although my mother, for some reason had never before told me, a late great uncle of mine who had been a doctor trained and worked at The London Hospital many years earlier and, in fact was responsible for inventing/ designing the original dental scanning x-ray machine that is widely used (if updated) today, and in 1971, he was introduced to the Queen at the hospital as a result. I entered the hospital and found my way to where I was to have my hospital tour and interview. I had been to other old- fashioned and highly respected hospitals before The London, where they wore similar uniforms with starched aprons, but there was something strangely unique about The London. The sleeves were puffed, the dresses proudly bore four large buttons, (Sister’s button’s were made of real mother of pearl), and the students had straps on their aprons. This made the nurses almost appear in some beautiful way to have stepped out from some past era. This actually was not far from being true, as far as the uniform was concerned, as it was designed by Norman Hartnell (designer to the Queen), but was not far removed from the uniforms worn at the turn of the 20th century, as those of you who recently saw Casualty 1909 on television will understand, and the hospital archive museum demonstrates authentic costumes from this period. In fact, just to digress one moment, I understand that The London, along with one other hospital, which I believe is in the USA, has the best archives of any hospital worldwide. This is down to, not only their collection of uniforms, surgical tools and other artefacts, but also, really well documented records of events and patients’ notes and details etc. I know that nowadays everything has to by law be documented, but I believe I am right in saying that when I began my training we were the only hospital in London to have computers on the wards; we thought were very avant garde! In addition to using computers to order x-rays and various tests though, we wrote reams of notes about our patients. As they were admitted we had a huge booklet of questions to ask them, (now quite standard, but the questionnaire had only just been extended before I started training, and to those more senior than me, these forms seemed very challenging indeed). In addition to these preliminary notes, we wrote records regarding each patient’s condition (27 patients on each ward), at the end of every shift, of which there were three a day: early, late and night duty. When I had my interview, I was immediately offered a position at the hospital. I was told not to make a decision straight away, and not wishing to appear too keen I waited a few weeks before accepting my place, but in my heart I knew that compared to the other hospitals I had seen, even the top hospitals, this was where I had to be, there was an atmosphere I sensed I would like to spend the next three years at least, of my life. I loved my training days, and all the time I spent afterwards as a staff nurse at The London, but nursing isn’t nursing without the patients and to this day I have many fond memories of so many of them. I often feel I could write a book with all the funny, sad, fond or just poignant memories of those times. 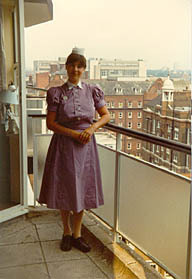 Things were on the change in the late 1970s when I began working at The London. Most London teaching hospitals, The London Hospital included, are centres of excellence, usually in one or more fields. For example, The London boasts wonderful trauma care (now, of course having the marvellous helicopter air ambulance on its roof), and including neurosurgery, plus a renal transplant centre and a now, sister hospital to Barts (incidentally where I was born) is renowned for its specialist paediatric cancer and oncology care, but there is one thing that makes The London rather different from many of the other very well known large teaching hospitals, for example, St. Thomas’s, St.Bartholemews, University College Hospital and Guys, to name a few. The London Hospital was built in a densely populated area, whereas the other hospitals mentioned, are placed more in the City and central London where people work, but these areas were and are not largely populated. This makes The London Hospital completely different from a nursing and medical perspective. Working in large teaching hospitals one expects to learn about the rather unusual or complicated conditions, which is extremely interesting, but in some ways one can miss out on basic nursing and medical situations as patients very often travel from the other end of the country to get such specialist treatments. Obviously this did happen at The London, as one would expect, but with a large indigenous population to serve, the hospital was also a local hospital, known affectionately as ‘The People’s Hospital’. 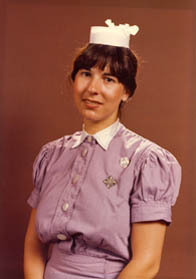 We felt proud to be nurses, or rather student nurses, from the day we began and wore our uniforms with pride. One lovely tradition we had at the beginning of each duty was to go into the changing room attached to each ward, where we each put on our crisp, clean, white starched aprons. The only person not to join us there was Sister, who incidentally took her name from the ward where she worked; that is sister of Turner ward was Sister Turner, Royal Ward was Sister Royal and so forth. Sister, who had her own office, would put on her apron and go onto the ward ahead of us, then when whoever in charge beneath Sister for that duty was happy that we were all present and all looked neat and tidy, we would all file on to the ward together in a line. I think we must have looked lovely, usually led by a Staff nurse or a 3rd year student, and as we walked on, we would say ‘Good morning Ladies’ or ‘Gentlemen’ (we never had mixed wards apart from very rarely when a ward had to be closed for refurbishment or other reasons). It really cheered the patients up when we called to them, and at the end of our shift we would never dream of leaving without saying ‘Goodbye’. The wards had originally been Nightingale style; big open wards with beds either sides and an open fireplace, I understand in the middle, but they had been changed to T shaped wards, with a big end which had six beds on either side, then either two bays of six, or three bays of four (they varied from ward to ward). In addition, there were three side rooms - a total of 27 beds. We would usually work either in the ‘big end’ of the ward or cover the bays and side rooms, but obviously we had to be flexible depending upon if we had a very sick patient who needed one-on-one care etc. Some patients came and went and I would hardly remember who they were, but by and large my patients all meant something to me. Even if now, 30 years on, although I can’t remember everyone and everything, of course, there are so many things and people I do remember, some because they touched me in a very special way and others because the incidents were so funny. On my first ward we had a dear little Jewish Lady who had Alzheimer’s disease. I forget why she was in hospital, but as it was a cardiac ward I imagine it must have been something related to her heart. Bless her, all day she wanted to know when it was her next meal and wanted to go to bed. She was 97 years old and had no memory of her past life. One evening her granddaughters came in to see her. I asked them about their grandmother and her past life. They told me she was a doctor of philosophy; having gained two PhDs, and had been a senior lecturer in Israel. I felt so sad that someone so brilliant had become so pathetic and I used her always as a moral flagstone, so to speak, whenever I nursed patients who had dementia, or even were just delirious or suffering depression or whatever – that they were someone’s son, daughter, parent, sibling, spouse etc. As I said at the very start, my Jewish origins began in the East End of London and it was very interesting to see that many of the older patients were Jewish, whereas the younger population arriving in and around Whitechapel were Bengali. It was a fascinating mix for me to see, as I could imagine this was how it had been for my own family only two generations back. Largely, the women found it quite difficult to converse in English and depended greatly upon their husbands and children for translation. Often in the queues at the fruit barrows the Bengali women would have their children with them to help them purchase their fresh fruits and vegetables. (I always loved buying from the barrows, because once they realised we were nurses they would pop an extra apple or orange in the bag for us). Returning to the language barrier reminds me of two funny things I can remember happening when I worked in maternity during my training. Both these incidents concerned Bengali families. The first incident happened when a woman, accompanied by her husband arrived for her post- natal check-up and family planning consultation. The doctor and husband discussed for seemingly ages the possibility of the woman using the pill. They both agreed it seemed a good idea. The only thing the doctor had to ensure was that she would remember to take it each day. Further discussions pursued, with the doctor asking the husband if his wife prayed each day, because; if so, that would be the best time to take the pill. The other memory I have on a similar vein, also while I was in the post-natal clinic, was when a different Bengali couple came back to the clinic one month after the woman had been seen there and on this occasion the doctor had decided to give the woman the pill. He had given her six months supply, as was the norm at that time, so he was rather perplexed when she and her husband had returned just one month later with her husband asking, on her behalf for more pills.